rescuers and residents wade through the streets in waist-deep water, trying to save themselves from the flood and landslides that now beset many parts of Indonesia. The latest deluge has claimed the lives of 59 people and drove thousands to flee from their homes. “I’ve never seen something this bad – this is the worst,” Syamsibar, head of South Sulawesi disaster mitigation agency said in a statement adding that 25 people were still missing. The heavy rains and overflowing rivers engulfed dozens of communities in 11 districts of southern Sulawesi. Parts of the provincial capital Makassar have also been heavily affected. Approximately 3,400 people were ordered to vacate their homes and sent to neighboring schools, mosques and evacuation tents refuge. 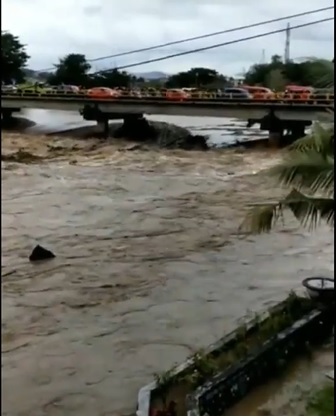 For high-damage prevention and mitigation purposes, the government “urge people to always be aware of the possibility of floods and landslides,” national disaster agency spokesman Sutopo Purwo Nugroho said in a statement. Authorities say floodwaters have diminished but the impacts of the catastrophe have been devastating, destroying houses, government structures, schools and bridges. Mud slides and deluges are common in Indonesia, especially during the monsoon season between October and April, when heavy downpours flush out the immense Southeast Asian archipelago. In 2018, flash floods and landslides exterminated no less than 22 lives in many areas across Sumatra Island, while several died when an inundation of mud and rock tumbled down a vertical slope in central Java, Indonesia’s main island. In 2016, also in Central Java, almost 50 people died when heavy downpours sent torrents of water, mud and rock into villages. Indonesia is one of the most calamity-prone countries on Earth, spanning the Pacific Ring of Fire, where tectonic plates run into each other. Volcanic upsurges and seismic activities are also common.